The federal government will not issue any new permits for offshore fracking in California after a settlement was reached on Friday in a case brought by the Center for Biological Diversity. The lawsuit alleged that federal regulators “rubber-stamped permits” without enough consideration for fracking’s impacts on coastal communities and wildlife, the Associated Press (AP) reported. The settlement directs the U.S. Department of the Interior to conduct an environmental assessment of offshore fracking by May 28. There will be a 30-day public comment period on the draft assessment. Offshore fracking has been going on for years in federal waters, but gained more attention in 2013 when Santa Barbara-based Environmental Defense Center and the AP filed Freedom of Information Act requests with the U.S. Department of the Interior. The resulting investigation revealed that California regulators were unaware of more than 200 instances of fracking operations in state and federal waters off California. A 2o14 report from the Center for Biological Diversity found that California’s oil industry is allowed to dump 9 billion gallons of wastewater into California coastal waters every year. 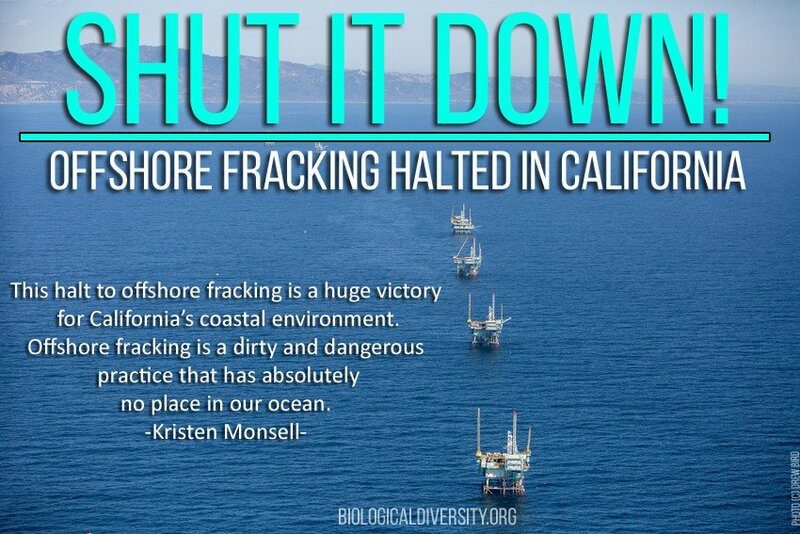 The report also found that offshore fracking threatens wildlife, pollutes the air and increases earthquake risks. “These practices are currently being conducted under decades-old plans with out-of-date or nonexistent environmental analysis,” Brian Segee, an attorney for the Environmental Defense Center, told the AP. A Department of Interior spokeswoman told the AP the agency would comply with the agreement and is committed to safe offshore operations. However, the American Petroleum Institute, which intervened in the case as a defendant and did not agree to the settlement, told the AP it did not think the environmental review was needed and did not think a permit moratorium was justified.